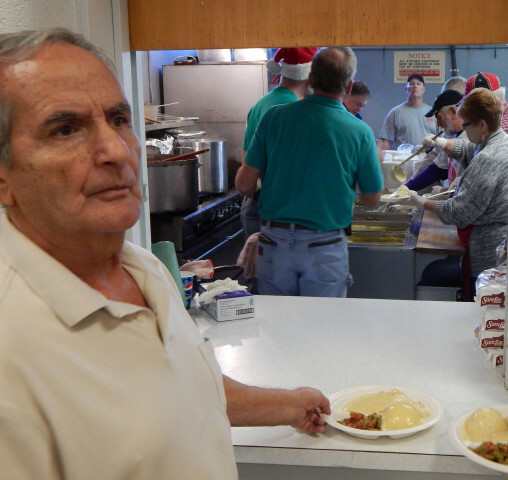 For the 36th year in a row Bill Fekas is planning to prepare a free community-wide Christmas dinner. The Salina chef is in need of a little support. Fekas is planning to prepare and serve a free dinner to as many as 4,500 people. This will be the 36th year for the Fekas Family Christmas Dinner in Salina. Fekas, with the help of a small army of volunteers, has been preparing a turkey dinner with all the trimmings for over three decades now for a gathering that has grown from serving about 30 people the first year to now over 4,000 each year. The free meal is open to anyone and everyone in the community. Fekas points to his volunteer helpers as the key to getting things ready to eat on Christmas Day. Though the meal is free to those attend, it is not free for Fekas. “Right now we need some donations to pay the bills,” he said. Fekas explained how the food must be ordered and paid for in advance so the items can arrive in time for preparations. Fekas will prepare 200 turkeys for the meal. Among other things, he is also purchasing a half-ton of potatoes, and 800 loaves of bread to make stuffing with. “I would appreciate it very much if anybody would help us pay the bills,” he said. The Bill Fekas Family Christmas Dinner is at the 4-H Building in Salina on Christmas Day. Donations are needed to make sure the dinner stays a tradition here in Salina. Those who want to send a check can mail it to : Bill Fekas Family Christmas Dinner – PO Box 2173 – Salina Kansas 67401. Donations are tax deductible. Bill Fekas had a dream back in the early 1980s – to prepare and serve a free dinner for anyone who was alone on Christmas Day.